How will I know when my order ships & can I track my package online? As soon as our warehouse ships your order, we will send you an email notifying you that your package is en route. In this email we will include a link to track delivery. Will I be responsible for import duty, VAT, or other taxes outside of the US? We ship to many EU countries from our EU shipping facility. For orders shipping to the EU shipping zone, VAT is included in the item price. For other countries in Europe, customers are liable for VAT upon delivery. Canadian, Hong Kong and Australian orders are also not subject to import duty, if other taxes apply they will appear in your cart prior to completing checkout. Customers with shipping addresses outside of the U.S., our EU shipping zone, Canada, Hong Kong and Australia, are solely responsible for all duties, import taxes and brokerage fees. These are not included in the cost of shipping or handling of your order. Customs, duties, and taxes vary widely from country to country; please check with your local customs agency for details on estimated costs. Customs, duty, and taxes are non-refundable: so if you refuse a shipment because of unexpected import fees, the cost of the original shipping, any brokerage/customs/duty/taxes, and any return shipping charges will not be refunded. You are more than welcome to place an order and send it as a gift to an address other than your billing address. When placing the order, please ensure that you are entering the shipping address and your separate billing address correctly. We are unfortunately not able to gift wrap or add notes/cards at this time. If you are looking to cancel an order that was recently placed, please immediately contact our Customer Support team. Once an order has been placed, there is a very short time frame where we are actually able to cancel, so we cannot guarantee that we will be able to cancel your order. All orders typically ship out within 24 hours of ordering. Should cancellation not be possible, you can refuse delivery of the package, and a refund will be issued minus shipping costs upon return receipt of the package. 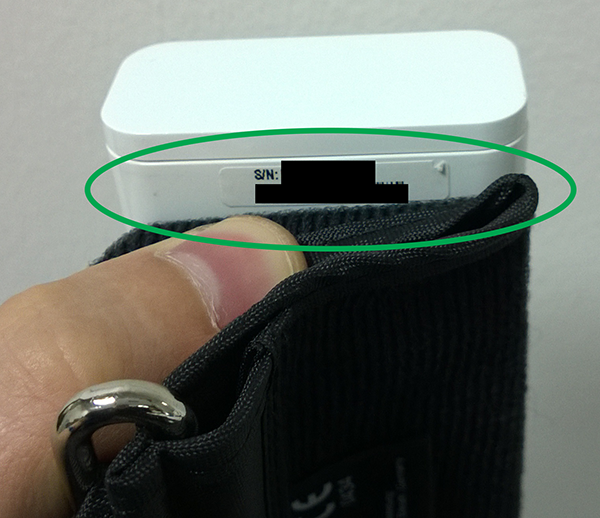 If you have received the package, and would like to return for a refund, please contact us for a Returns Authorization (RMA) and returns instructions. Shipping cost is determined by the weight & size dimensions of your purchased items, the distance between our closest warehouse in US or Europe and your shipping address, and the shipping service requested. We currently ship to the United States, Canada, Australia, Hong Kong and the following countries in Europe: Austria, Belgium, Croatia, Cyprus, Czech Republic, Denmark, Estonia, Finland, France, Germany, Greece, Hungary, Iceland, Ireland, Italy, Latvia, Liechtenstein, Luxembourg, Malta, Monaco, Netherlands, Norway, Poland, Portugal, Romania, Slovakia, Slovenia, Spain, Sweden, Switzerland, Turkey, United Kingdom. 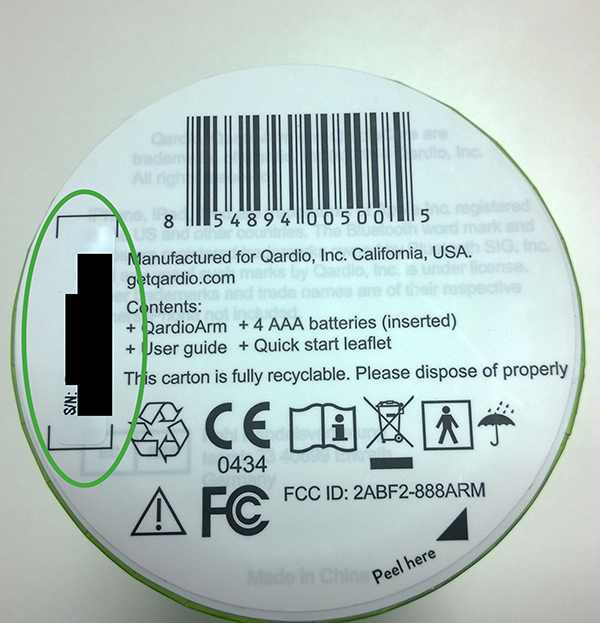 How do I find my QardioArm’s serial number? If at any time within 60 days of receiving your order, you are not 100% satisfied, you may return it to us for a refund. No questions asked. If you bought your product directly from Qardio on getqardio.com, and you are not satisfied with your purchase within 60 days of receipt, you can return it following the below procedure. Your card will be credited upon receipt of the returned merchandise. Any items damaged due to reasons not covered under warranty cannot be accepted back for refund under our 60 Day Money Back Guarantee. Also, associated shipping fees are not refundable. Request an RMA (Return Merchandise Authorization) number by contacting Qardio Customer Support Package products along with a copy of the RMA form. Follow the instructions that we will email you. Items must be received by Qardio within 60 days of issuing the RMA. NOTE: this guarantee only applies to orders placed on Qardio Market at getqardio.com. We accept Visa®, MasterCard®, EuroCard, Discover®, American Express®, Diner’s Club®, JCB, PayPal and Apple Pay, as well as check cards and ATM cards if they are issued by one of these major credit card companies. All credit card information submitted is encrypted, so you can be confident that your credit card information will be kept safe and secure. In the U.S. we also offer the option to pay in instalments using Affirm. The Affirm payment option will become visible on the checkout page only for shopping carts with a value of 99 USD or higher. In the UK and EU, we also offer the option to pay 30 days after delivery. In cooperation with Klarna Bank AB (publ), Sveavägen 46, 111 34 Stockholm, Sweden, we offer you the following payment options. Payment is to be made to Klarna: · Pay later. Further information and Klarna’s user terms you can find here. General information on Klarna you can find here. Your personal data is handled in accordance with applicable data protection law and in accordance with the information in Klarna’s privacy statement. For purchases of physical products, you will be billed when you press ‘Place Order’ on the website. This includes any preordered or backordered products. Qardio is always doing its best to protect you from any kind of fraud. Sometimes this can cause perfectly legitimate purchases to be refused. You entered the wrong details. We recommend checking you have the correct details and try again, or try using another card. Yes. You can pay with PayPal and Apple Pay.